With the Jet Airways fleet grounded, the slots of this airline at key airports and the lease of its aircraft is up for grabs. 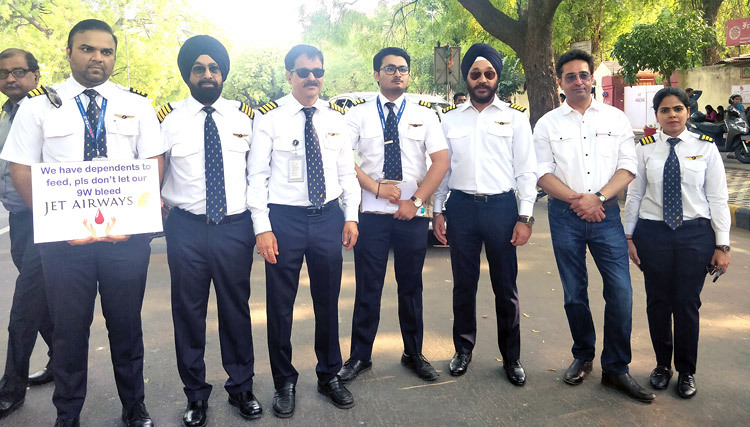 Jet pilots, who staged a protest at Jantar Mantar in New Delhi on April 18, pleaded quick intervention by the Government to prevent the dismantling of the airline, complaining that inaction in bailing out Jet would amount to giving undue benefit to its business rivals. Besides at several other airports across the country, the Ministry of Civil Aviation will allot 280 Jet slots at Mumbai and 160 at Delhi to other Indian carriers for a period of three months. Jet is in provisional lockdown till May 10. If the distressed airline does not revive its operations within three months, the re-allotment of its slots will be extended by one month at a time. It's pilots too are being aggressively poached. An estimated 300 have already been grabbed by competing carriers. "Seventy-five planes used on domestic routes have gone out of the system while other Indian carriers have bought in 58 planes in last five months," Civil Aviation Secretary PS Kharola told media. Air India and SpiceJet are also moving quickly to lease aircraft which are available or re-possessed by lessors following the Jet meltdown. According to reports, Air India chairman Ashwini Lohani wrote to SBI CMD Rajneesh Kumar on Wednesday, asking the Bank to release five Jet Boeing 777s for long haul flights. Ahead of the peak summer season, Air India intends to start five new flights - Delhi to London, Singapore and Dubai, and Mumbai to London and Dubai. The national carrier is also prospecting the grounded Jet Boeing 737s for its subsidiary, AI Express. "Seventy-five planes used on domestic routes have gone out of the system while other Indian carriers have bought in 58 planes in last five months," Civil Aviation Secretary PS Kharola told media. These aircraft have gone out of the system mainly on account of the grounding of Jet and also the Boeing 737 Max 8 fleet (which involves Jet and SpiceJet). "The drop in capacity currently is 17 planes. Other airlines have told us they will induct 31 more planes in May, June and July as per normal induction plans and they may get leases for another 20-plus. We have requested all airlines to expedite induction of aircraft as summer demand for travel is very strong," Kharola said. The Government's intention is to ensure that flying capacity is restored ahead of the peak travelling season, and rising fares brought down to near-normal levels. Those airlines which can quickly induct more aircraft tend to gain more slots. To tide over the shortage caused by the grounding of 12 Boeing 737 Max 8 aircraft in its fleet and further beef up numbers, SpiceJet has taken on lease a large number of Boeing 737s that lessors repossessed from Jet. SpiceJet on April 18 declared that it would induct "six more Boeing 737-800 NG aircraft on dry lease in addition to 16 Boeing 737s and 5 (Bombardier) Q400s" and that "the total number of planes to be inducted in the immediate future now stands at 27". This low cost carrier also announced 24 new flights connecting major hubs Mumbai and Delhi with other cities. Protesting Jet pilots warned that dispersal of its assets would kill the airline. At a sit-in at Jantar Mantar in the Capital, they reasoned that Government-owned banks which have taken over the estimated 8,500 Crore debt from Jet founder Naresh Goel should have a vested interest in reviving the airline so as to recover the debt. "Why are the banks stalling the revival after taking over the debt?" questioned Captain KJS Cheema, a senior A330 commander who has flown for the airline for over 24 years. "Timing is of the essence. If nothing is done in one week, the airline will be over, and the banks can say goodbye to the chances of recovering debt," he argued, charging that "SpiceJet is a direct beneficiary of the inaction". "A bailout of 1,500 Crore was promised to us by the banks. This is what is required to put the whole operation in the sky again. This interim relief is necessary till the bidding process to find a new promoter is complete. This payout is also necessary for the banks to have a realistic chance of recovering the 8,500 Crore debt," echoed Captain Ashwini Tyagi, a Boeing 777-300 ER commander. "The airline has to be flying for the bidding process to be meaningful," shrugged Captain Rohit Chaudhary, also a senior A330 commander. Emotions were palpable. Most of these senior pilots have put in over two decades with Jet. Cheema, a former Mirage-2000 fighter pilot with the Indian Air Force, cannot believe that the April 5 flight from Amsterdam to Delhi was the last time he flew for Jet. "When I joined Jet 24 years ago, it had only four aircraft. I was part of the journey of the airline growing to a fleet of 127," he said. For Chaudhary, the involvement is even more intense. His wife, Deepa, too is Boeing 777 commander. "Jet is India's major aviation brand, visible internationally. It's a national asset," pleaded Tyagi. 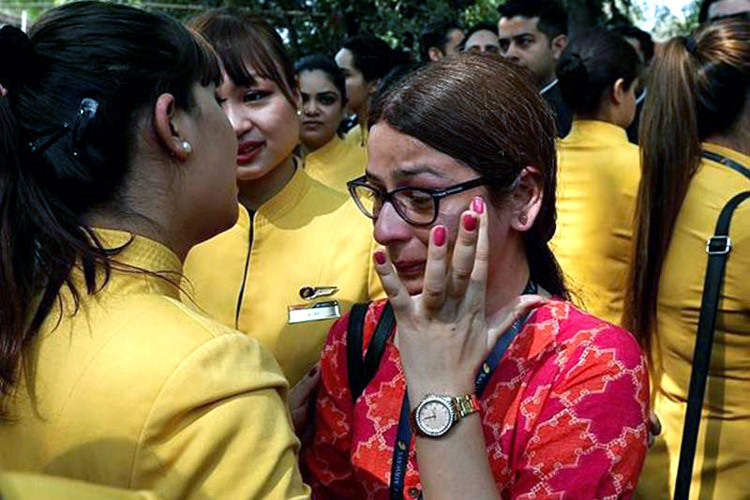 The 23,000 Jet employees, on whose behalf representations were made to the President of India and the Government, want a helping hand, urging that the airline they have built with blood, sweat and tears is not pilfered and dismantled.